Villavicencio beatification homily: “Your birth, Virgin Mother of God, is the dawn that proclaims joy; from you was born the sun of justice, Christ our God.” Mary is the first light who announces night’s end and impending day; her birth helps us understand the tender, compassionate, loving plan in which God calls us to an everlasting covenant with him. Mary knew how to transmit God’s light and reflected that light in the home she shared with Joseph and Jesus, and in her people, her country, and creation. The genealogy of Jesus is a living history of God's people; by making himself one of us, God announced that human history runs through his blood, that our salvation is concrete, life moving forward. The list tells us we're a small part of history and helps us not to consider ourselves too important; it helps us not over-spiritualize things and withdraw from reality. It also integrates exile-like moments of desolation and abandonment into our salvation history. The women in the genealogy tell us pagan blood runs through Jesus' veins and recall stories of scorn and subjugation. The Gospel starts by highlighting women who made history. Mary permitted God to take charge of history. Joseph didn't let pride or passion expel him from light; his initial decision shows his human qualities: he made dependent on charity what he learned from the law; he's a figure of the respectful and sensitive man. Though he doesn't understand everything, he favors Mary’s good name, dignity, and life. God enlightened his judgment. We're God’s people too; we recount stories of love and light; disagreement and death, exile and grief, spite and resentment, justice and kindness. We can allow light and reconciliation in by like Mary and Jesus embracing all history and like Joseph putting pride aside. Say yes to truth, goodness, reconciliation; fill your history with gospel light. Reconciliation opens a door to every person who's experienced conflict. Victims who overcome the temptation to vengeance become peace-builders. Take the first step. Hope! Reconciliation isn't to accommodate injustice; it's to overcome egoism, renounce pseudo-justice, and establish a coexistence based on respect and proper values. It makes hope grow and enables us to build the future. Matthew begins and ends with Emmanuel, God-with-us. This promise is also fulfilled in Msgr. Jesús Emilio Jaramillo Monsalve and Fr. Pedro María Ramírez Ramos, people rising up out of violence and bitterness. Say yes to reconciliation, and include the natural environment. The violence in our hearts is also reflected in the symptoms of sickness evident in soil, water, air and all forms of life. Say yes with Mary; as the Lord promised, he helps all nations and peoples. Villavicencio prayer for reconciliation: Every act of violence against a human being is a wound to humanity. I want to be close to you, see and hear you, open my heart to your witness, embrace you, weep with you, and pray, forgive, and ask forgiveness with you. The Crucifix of Bojayá reminds us of the suffering, deaths, and broken lives here. Christ looks upon us and loves us. The image of Christ broken and without limbs shows he came to suffer for and with us, to show us love is stronger than hate, death, and violence. He teaches us to transform pain into a source of resurrection, so we may learn the power of forgiveness and love. “Mercy and faithfulness will meet; righteousness and peace will kiss” follows “Restore us!” Thank you, Lord, for the witness of those who ask for forgiveness and those who suffered and forgive. Pastora Mira, you place your suffering at Jesus' feet so that united to his suffering, it may be transformed and break the cycle of violence. Breaking the cycle is only possible through forgiveness and reconciliation. With the help of Christ, it's possible to conquer hatred and death and begin again. The Crucified has given you strength to forgive and love, and hope that peace will triumph. The heart's wounds are deeper and harder to heal than the body's. We can't live with resentment, but only with a liberating love. Luz, going out of yourself has enriched you, helped you look ahead and find peace, serenity, and a reason to go on. By your love and forgiveness you help people walk in life. Deisy and Juan Carlos, you help us understand we're all victims, united in loss, violence, and death. You studied, and now you work to help victims and prevent people from falling into violence and drugs. Justice requires that perpetrators undergo renewal. We must help heal our wounded society. Hard as it can be to believe, change is possible for those who appealed to violence to promote their agenda, protect their illegal affairs, or claim dishonestly they were defending others. It's a challenge to trust they can take a step forward. Be attentive to fruit amidst weeds; care for the wheat and don't lose peace because of the weeds. See how the Word becomes incarnate in concrete situations and produces life even if it appears imperfect or incomplete. Even amid conflict, violence, and vengeance, don't hold back justice and mercy. Welcome every person who admits their failures, is repentant, and wants to make reparation; help build an order of justice and peace. Throughout the process of reconciliation, come to terms with truth. Truth can't be separated from justice and mercy; all are essential to building peace, and each prevents the others from being transformed into instruments of revenge. Truth should lead to forgiveness and reconciliation, not revenge. Tell families in pain what happened to their missing relatives; confess what happened to minors recruited by violent people; recognize the pain of victims of violence and abuse. Open your heart and be reconciled. Don't fear truth or justice. Ask for and offer forgiveness. Reconciliation allows you to encounter one another and surmount enmity. Heal wounds, build bridges, overcome differences, defuse hatred, renounce vengeance, and open yourselves to coexistence founded on justice, truth, and encounter. May we live in harmony and solidarity. Pray to be peace-builders, bringing love and mercy where there's hatred and resentment. O black Christ of Bojayá, you look tenderly on us. May we help restore your body. May we be your feet to encounter those in need, your arms to embrace those who have lost dignity, your hands to bless and console those who weep. Make us witnesses to your love and mercy. At day's end: Vulnerability is the essence of the human person. We're all vulnerable, except for the Lord himself. 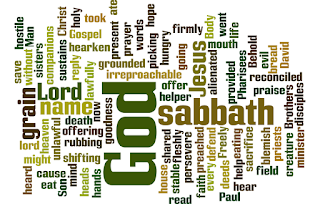 Col 1:21-23 You once were alienated and hostile because of evil deeds, but God has reconciled you in the Body of Christ through his death, to present you irreproachable before him, so long as you persevere in faith, grounded, stable, not shifting from the Gospel hope you heard. Creighton: God is my help, the source of love, joy, healing, and reconciliation. 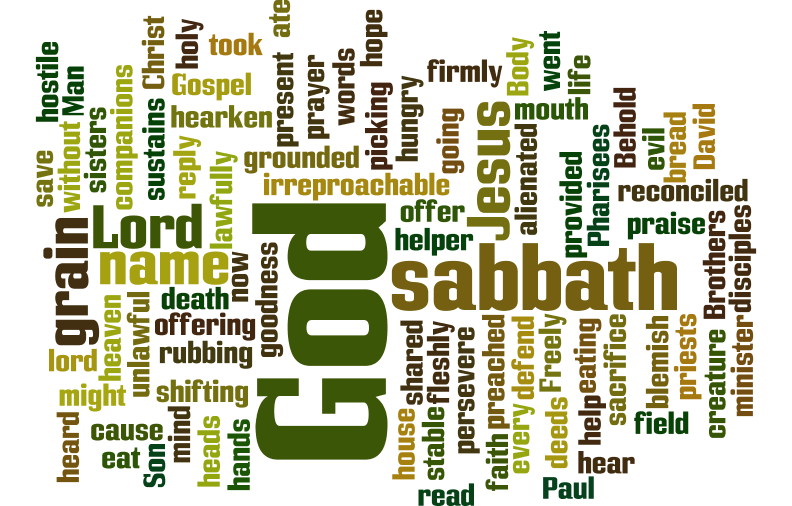 I can get caught up in things and forget to take time to remember the Source in a Sabbath rest. Today I'm called to pause, look around, and see God. How and where is God calling us to look more deeply? One Bread, One Body: Without Jesus, we'd be alienated from God, others, the world, and ourselves; we'd nourish hostility and hate. We were dead. We "gave allegiance to the prince of the air, the spirit at work among the rebellious. We were of their company; we followed every whim and fancy and so deserved God's wrath. But God, rich in mercy, brought us to life with Christ." Jesus makes all the difference. Jesus is the Way to the Father, Truth, Life. the Resurrection, King of kings and Lord of lords, and God. So give your life to him, worship him, renew your baptismal promises, pray that people live for him, tell people about him, make disciples, and love Jesus. 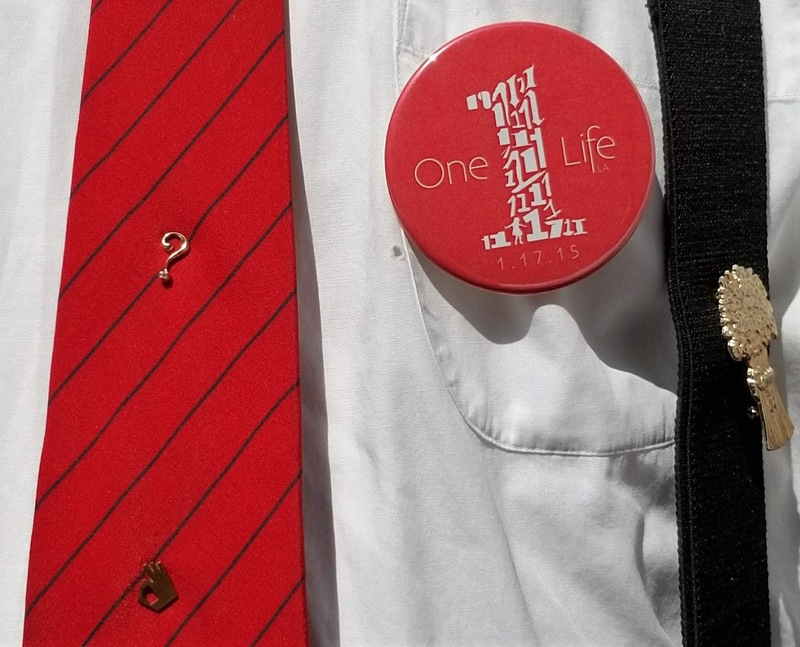 Passionist: "A Colossian from Cartagena?" Yesterday's 1st reading spoke of Jesus, image of God, who reconciled all things in himself through the blood of the Cross; today Paul is down to earth: Jesus died and presents us to the Father. We must be unshaken in faith and hope. Peter Claver arrived in Colombia in at the age of 29. Though limited by language and health problems, he served the ships at slave trade hub Cartagena, tending the sick and baptizing the dying. “We must speak with our hands before we speak with our lips.” In his day some supported his work, some found him bothersome, and some refused to enter a church or confessional with the slaves he served. Tomorrow Pope Francis will visit the shrine of Peter Claver and bless a homeless shelter. Modern-day slavery and issues of race, dominance, care for the poor, and reaching out to the margins need people inspired by Peter's example and approach. Jesus died, but Paul, Peter, Pope Francis, missionaries, and we who follow Jesus proclaim the Resurrection and strive to live reconciliation. 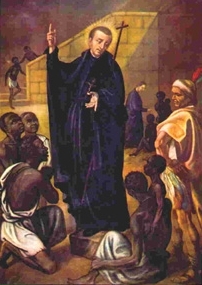 Peter Claver, Jesuit priest, "slave of the Negroes forever," attending to their spiritual and material needs. He brought food to the ships, instructed and baptized slaves, followed their progress, and tried to defend them. He organized catechists and worked in hospitals and prisons. Many inside and outside the Church opposed him. See Cartagenainfo.net, New Advent.